Turned inside out uppers ready to be lasted. Preparing the upper and sole for stitching. Building the insole or shank with layers of leather and other substances. Shaping the toe block with a hammer. Traditional pointe shoes are manufactured much as they were at the end of the 19th century. Made by hand, by skilled craftsmen who cut the various components from materials such as satin, leather, canvas, hardboard and more, and then build the shoe on a last. Several of the worlds leading pointe shoe manufacturers take great pride in the fact that they employ craftsmen that have been shoemaking for 20, 30 or more years, and some are even second and third generation cobblers. Traditional pointe shoes are a "turned shoe" which means they are first made inside out, and then turned rightside out during the manufacture process. While the basic method of making the shoe is the same as over 100 years ago many things have changed over time in the various factories that manufacture pointe shoes. Components are prepared in different departments in the factory, the upper is made using three pieces of cotton backed satin which are sewn together, with cotton linings. The upper is now joined at the back and a piece of ribbon (known as the backstrap) is sewn on covering the back seam. This operation is called closing the shoe. Sewing machine operators make these uppers and they are stored in sizes until the maker is ready for them. All the components are die cut using an air operated "clicker" to ensure 100% accuracy in the cut of all the components. Similarly the sole is cut from a sheet of leather using dies and a mechanical press, the same technique is used to cut the insoles and dressing socks. The sole is Channeled in that a groove is cut into it about ¼’’ in from the edge and angled towards the edge. The edge of the sole is also shaped during the same operation. The maker starts by pinning the sole onto the last. 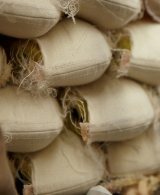 The preassembled upper is now place over the last and outsole and the toe block is formed by using 1ayers of canvas, burlap and other ingredients, together with a specially formulated paste, this is the point when the block is pleated. The maker now passes the shoe to a sole stitcher who stitches the upper to the sole using the previously cut groove where the stitches sit. This is now passed back to the original shoe maker for the completion of the block formation. At this point the shoe is still inside out on the last. It is now removed from the last, turned the right way, fitted with an insole and put back onto the same last. At this time the paste has started to air dry but is still damp and malleable so the toe block including the platform and wings can be shaped. The block is now shaped using an extremely smooth faced hammer. During this operation the platform is made, which is the most important part of the shoe from the Ballerina’s point of view. The shoes are now placed on racks and into an oven overnight to allow the block to harden, though full curing of the block takes about ten days. Use of the shoe before it is fully cured can be dangerous but, in practice, this never happens as the shoes have to go through more stages, plus delivery, before the dancer gets the shoe and curing continues throughout this period. The shoes now go for binding where the uppers are cut down, the top is bound and a drawstring inserted at the same time. Most pointe shoes are straight lasted, which means that there is no left or right shoe. In fact all the shoes are made individually, not in pairs. They are paired later by visual inspection and comparison. The last operation is the insertion of the sock lining or insole. The shoes are now bagged and ready to ship. Finishing the binding and drawstring.